When it comes to dress wear, it’s no secret that it’s far more difficult to get a well-fitted suit jacket than it is to get a well-fitted dress shirt. Many times, as long as you know your shirt size, you can find something that will comfortably fit you. 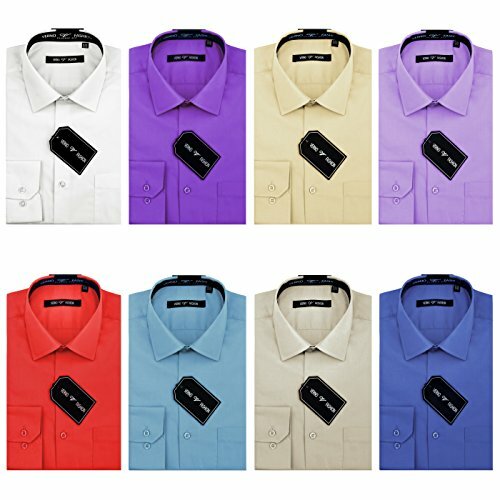 The only negative is that there are so many brands of men's dress shirts on the market; it can get overwhelming when trying to find the best ones. We’ve compared five of the highest rated dress shirts to help you make your next decision. How Do You Wear a Sweater Over a Dress Shirt? What Do You Wear Under a Dress Shirt? What are Dress Shirts Made Of? How Do You Fold Dress Shirt? What are Athletic Fit Dress Shirts? Choosing the perfect shirt can be a challenge for a man, especially with all the options out there. That’s part of the reason why we’ve taken five of the best men’s dress shirts and compared them against each other to make life a little easier. 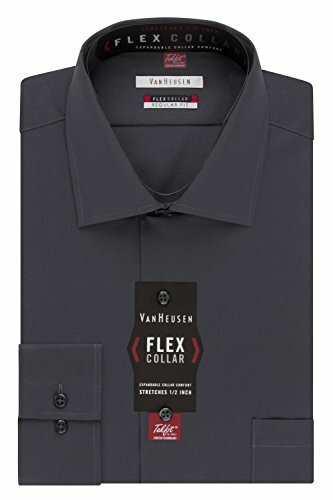 We started off with the Van Heusen’s Flex Collar shirt because of its versatility, affordability, and high ratings. As far as regular fit shirts go, this one appears to have everything that one could need. It comes in an array of colors from black to purple, and it is made of a 55% cotton and 45% polyester blend. It is imported, machine washable, and has a collar that stretches up to ½ inch. Additionally, the regular fit dress shirt has full sleeves, relaxed arm holes, and a freeing cut through the chest and waist. The brand compares the fit to a classic or full-cut fit. 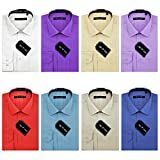 One of the main things that caught our attention about this shirt was not just the outstanding consumer reviews, but the wide variety of colorful dress shirts available. It was nice to see one for every occasion. The material also isn’t too heavy, so there’s no excessive sweating in the sun, but it’s not flimsy either. It’s a great shirt for someone with broad shoulders, and it is easy to tuck in. The brand seems to use pins during the construction process of the shirt still, so there appeared to be small pinholes near the bottom, and the flex collar feature seems to be almost non-existent. There also appears to be an issue with the buttons that cause them to be too big, because the fabric frequently slips off of the button. Moving on to the next dress shirt on the list, we bring in Gioberti. We were impressed by the ratings that this shirt had, along with the colors that it comes in. It’s unlikely that you won’t be able to find a color that this shirt doesn’t come in. Its price tag was just another reason that we chose the Gioberti men’s long sleeve shirt as a contender, but did it make the cut? Let’s find out. 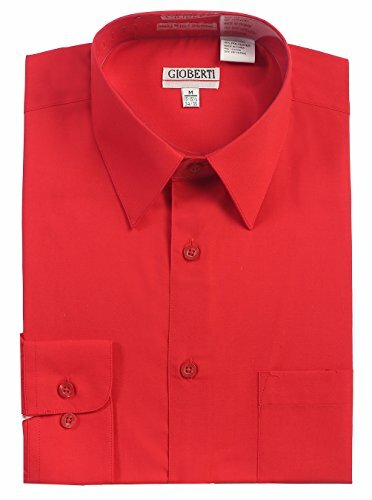 Regular fit shirts with a pocket seem to be some of the most popular dress shirts on the market, and that’s what Gioberti offers with this shirt. It is constructed of 55% cotton and 45% polyester, has a regular fit, long sleeve, and is machine washable. Additionally, the shirt has a rounded hem and a convenient chest pocket. The fabric on this shirt isn’t too thick or too thin. It is recommended that you wear an undershirt with it, but if you don’t, the fabric is thick enough to prevent people from seeing through it. It’s also thin enough to wear during the warmer months without sweating profusely. There are also pleats at the cuff of the shirt that gives off a tailored appearance, and it has excellent stitching. The price points of the shirt along with the variety of colors are added benefits. This shirt is very inexpensive, and we have noticed that some threads were hanging off. It also wasn’t as wrinkle free as we would have liked it to be, and we found that the sizing ran large in the collar, but small in the body. Paying attention to sizing with this shirt is an absolute must. Also, the buttons on the shirt were quite flimsy and plastic, and the sleeves were slightly short, but it was barely noticeable. The third shirt on our list doesn’t come in as many colors as the others, but it’s the first one featuring patterns, and that alone sets it apart. As with the others, the price tag along with the customer reviews spoke wonders for this regular fit shirt, and there was no way that we couldn’t try it out for ourselves. Made from a 100% cotton blend, the Muse Fath dress shirt is machine washable, though it’s recommended to wash by hand. It has a button-down closing, point collar, convertible cuff, and long sleeves to go with the printed color fabric. The shirt is quite sturdy, and sizes run to standard American sizes so checking the sizing chart is imperative. The Muse Fath shirt is exceptionally stylish and lovely to look at. The pattern printed onto the fabric is very appealing, and we loved the 100% cotton material. It’s also nice that the company provides a free exchange or even a complete refund if you get the wrong size, so the purchase is risk-free. The style made this shirt ideal for all types of outing events, and the broad range of sizes made it so there was something for almost everyone. This shirt runs small in the length department in comparison to most other slim fit shirts, and it seems to need to get ironed regularly. We wouldn’t recommend for those who need an athletic fit dress shirt as the sizing is off. Additionally, there appeared to be some looseness with the buttons as well as some threads that could cause an issue down the line. We were also expecting the colors to be vibrant and authentic to what was displayed, but they were darker and not as full of life. 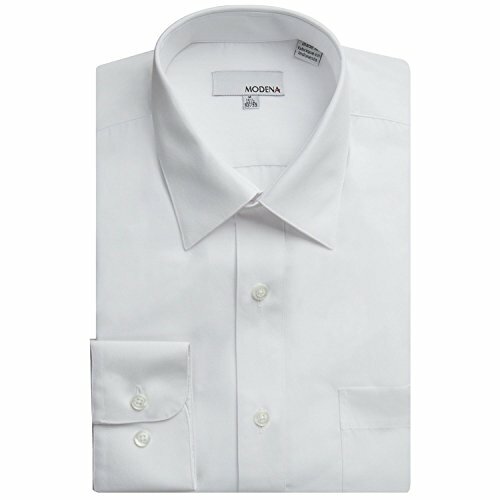 Taking it back around to the regular fit shirts, we compared the Modena Men’s dress shirt next. Just like the others, it also has high customer reviews, is affordable, and comes in a wide variety of colors. Finding the perfect dress shirt is essential, so it’s important to us that we look at all of the shirts from the inside out, so we can help you decide what you think is the best dress shirt. Much like the others, this Modena cotton polyester shirt got designed using a blend of cotton and polyester, which isn’t uncommon for a shirt such as this. It’s machine washable, has a pointed collar, regular fit, and a shirttail hem. The sizes that are made available in this shirt are very impressive and cover a vast stretch of body types and heights. We like that the shirt comes with extra collar stays just in case the others get lost. It also performs well in the laundry, irons well, and holds its shape even when hanging up for a while. The shirttail hem makes it easy to tuck in. It’s necessary to wear an undershirt with this dress shirt because the material is a little on the thin side. Depending on who you are, it could be a pro or a con; we just prefer the material to be a bit thicker. The shirt does easily wrinkle and requires quite a bit of ironing, even when you first receive it. Also, the fit isn’t as relaxed as it should be, and could even be in an athletic fit territory. However, with the range of sizes, it wasn’t much of an issue. We’ve come down to the final shirt on our best dress shirts of 2018 list, and we made sure that it was a good one, just like the others. 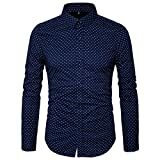 Depending on the type of style and colors that you prefer in your shirt, this could be the one that you like the most, or maybe it ends up being the one you want the least. Let’s break down the highlights. The 35% cotton and 65% polyester blended shirt is machine washable and dryable. It has a spread collar with removable stays, long sleeves, convertible barrel cuffs, shirttail hem for easy tucking, and the option of choosing between three sleeve lengths. Quality Guarantee: attractive in price and quality,Any questions please contact us. Concerning selling points, what gripped us most was the versatility. The shirt was perfect for casual, date night, business, and meeting wear, which made it easy to get our hands on a shirt that could be used on more than one occasion. We also rliked the removable collar stays because that made it easy to take them off before laundering them. The fabric is also softer than expected, and it was very comfortable to wear. Unfortunately, the sizes of these shirts run large in the chest and shoulders. The neck and sleeves, however, seem perfectly fine. There is also a bit of an issue with wrinkling that we noticed, though that issue seems to be quite common in shirts made of this fabric blend. There is also a noticeable stiffness with the collar that makes it difficult to put on a tie without added work. Understanding the size and fit of your dress shirt is the most crucial part of buying the shirt. If you already know your shirt size, you can move comfortably towards the type of fit that you’d prefer, but if you don’t, you can follow the below guide to measuring your size. The two numbers that you record are for your ready-to-wear or off-the-rack shirts. If additional help is required, there is always the option of seeking help from a professional tailor. The majority of men’s shirts come in four fits to choose from, depending on your tastes. To determine which fit is the best for you, try each one on and decide which of the four is the most comfortable. Skinny Fit, Classic Fit, Modern Fit, and Slim Fit are the four to choose from. There are plenty of fabrics to choose from when considering what type of shirt you want to buy. After all, shirts can be made from almost anything. However, in the traditional sense, there are select fabrics that are more popular when it comes to men and the shirt that they choose. It ultimately depends on your budget and your preference. Some of the most common fabrics are oxford, poplin, pinpoint or royal oxford, seersucker, and more. Your tailor or sales associate should be able to provide you with assistance when looking at different fabrics and styles. Just like fabrics, collars come in a wide variety that suits each person wearing the shirt. Depending on your preference, you are likely to prefer one over the other. If you’ve never worn a dress shirt before, it’s a good idea to consult with a professional tailor, especially if it’s going to be a regular occurrence. Unlike fit, fabric, and collars, there aren’t as many options to choose from when it comes to your cuffs, but it’s still an essential part of determining the right shirt. The most important thing to take into consideration when selecting the type of cuffs you are looking for is whether or not you’re going to be wearing cufflinks. Both single-barrel and double-barrel cuffs have built-in buttons that don’t require cufflinks, but double French and single French (usually not worn unless with a tuxedo) need a cufflink seal. Colors and patterns can be the most challenging part of choosing your shirt, just because the options are virtually endless, and there’s a good chance that you don’t want to wear a bright yellow shirt to your business meeting. Under most circumstances, plain white shirts are the highest form of formal, light-colored is comfortable business wear, and brights are social. The shirt and sweater combination has been around for as long as anyone can remember. It’s an easy resolution when there is a chill and makes for a versatile combination that can’t be ignored. When wearing a sweater over a shirt, it takes your style and attire to a different level. For a more casual look, you can pair your sweater/shirt combo with jeans; pair with dress pants for a dressier look. When choosing a sweater, you should pick one that fits your body and isn’t too tight or too lose. Next to the type of collar you want for your sweater, this is the most important thing. Collars are simple, as the majority of sweaters come in either V-neck or crew neck, and you need to decide what works best for you so that you can work your way to color selection. Wearing an undershirt beneath your shirt is extremely important if you want to avoid getting sweat stains all over your new shirt, but that’s not all they do. Some undershirts can keep you warm during chilly months, and some are designed to prevent moisture from the body. Many people think that wearing a T-shirt under their dress shirt is the same when it’s not. T-shirts aren’t designed to be worn under a sweater, so they are bulky and large. Undershirts are made for the sole purpose of being worn under something else, so they are typically thinner and far more comfortable. It’s also important to wear an undershirt that matches your skin-tone instead of one that matches the color of the shirt you wear. While dress shirts can come in a wide array of fabrics, there are three that stand out amongst the rest, have stood the test of time, and have proven themselves to be the most popular of them all. Cotton is the royal head of the fabric family and the one that the majority of people reach for first when choosing their dress shirt. Cotton shirts are durable, smooth, take shape, and have decent heat and moisture conduction. Another favorite dress shirt fabric is man-made fibers. It doesn’t have nearly as many qualities as a cotton shirt does, but they don’t wrinkle and are usually extremely affordable. Lastly, there is silk. Despite its short lifespan and high degree of maintenance, silk shirts remain popular. Maybe it has to do with the luxury fabric and light feel. No one likes to have wrinkles in their clothing, and one way to avoid this is by making sure that you fold your crisp shirts correctly once they come back from the laundry or dry cleaners. Folding a dress shirt isn’t that difficult; try following along with these steps and then watching the YouTube video for more help. The majority of men who are grouped in the athletic-fit category have two significant issues when it comes to finding a shirt. Most of the time they see one that fits their broad shoulders and muscular chest, but it billows throughout their torso and waist. Additionally, they find one that fits their body, but not the chest and shoulders. Athletic-fit shirts are designed with these men in mind. They are a perfect solution for men who have a muscular upper body and require more room in the arms, chest, and shoulders, but still, want something fitted to their waist. Comparing shirts to one another isn’t easy. 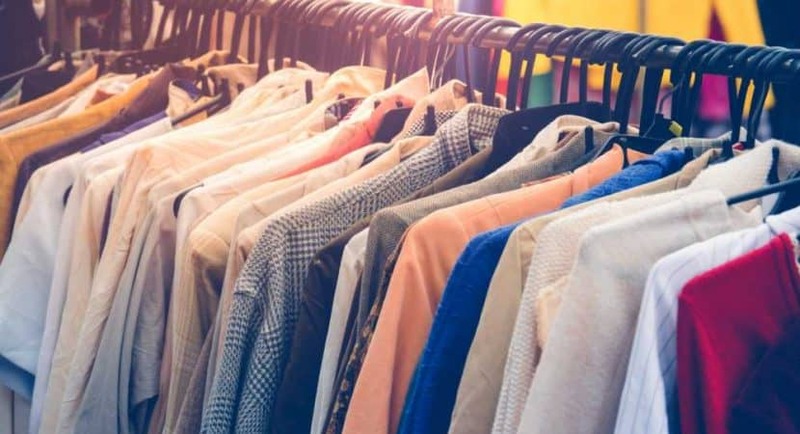 There are plenty of things that need to be taken into consideration such as how the fabric feels, what the fit is, if there’s an array of sizes and colors and if it wrinkles. Those are all elements that we looked at when determining just what the best dress shirt of 2018 was and while all of them were affordable, only one had everything we needed. The Modena Men’s Long Sleeve Dress Shirt is our choice not just for the variety of colors and high consumer ratings, but for the shirt itself. The pointed collar and regular fit made it extremely comfortable to wear, while the extra collar stays are a bonus that keeps you from worrying about losing the included ones.